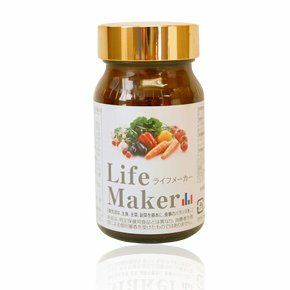 Containing a Multi-Mineral multi-amino acid and multi vitamin and multi Enzyme "Life Maker". The supplement contains plenty of Nice 25 ingredients, both young and old, to improve day-to-day functioning would be supported by standards. -Multi vitamin, Multi-Mineral plus, newly formulated multi-amino acid with grains fermented extract powder (multi Enzyme), now there are 25 kinds of ingredients. -Multi Enzyme is essential for life activities such as breathing, digestion, absorption, excretion, multi-amino acid is needed to improve the physical fitness and anti-aging ingredients. -Is a supplement designed by the consumer perspective in small capsules, drinkability is pursued. vitaminB6 are plenty of ingestion or cure disease, more is not to improve health. (Please observe one-day intake.
) Save for better performance, avoid direct sunlight, in a dry, cool place.